To the using addict, the ABCs of life are: Always Be Cool. To the newcomer in recovery, the ABCs are: Always Be Clean. But to the addict in long-term recovery, the ABCs are: Always Be Conscious. Like an iceberg, (whose mass below the water’s surface is nine times greater than that which is showing above,) the human mind is far more vast beneath the level of consciousness than it is above. It would be a fool’s errand to try to drag all of our subconscious mind up into consciousness, all the time; there’s just too much of it, and most of it is supposed to run silent and deep anyway. But it is absolutely essential that we acquaint ourselves with our subconscious, so that we are not fooled or betrayed by impulses we only thought we had understood and mastered. The ancients said that the essence of philosophy and wisdom was: “Know Thyself.” If nine-tenths of ourselves is unknown territory, we can hardly hope to know ourselves properly. Alas, most people only access that subterranean land in their dreams; and when they awaken, it seems to vanish like smoke. The subconscious is the realm of memories, habits, long-held beliefs and unconscious attitudes; and of the impulses, instincts, and desires that drive us – usually without the help of conscious, intentional decision-making. Most of those subconscious habits and states of mind are about as old as we are; they may go back to our very earliest childhood. (And perhaps even beyond.) And it can surprise us just how little some of those beliefs and attitudes may have changed, since we were small kids! To the unexamined mind, these habits and processes are all automatic: they run themselves, and are not under any conscious control. Clearly, it wouldn’t do to have all that stuff clamoring for the attention of our conscious mind all the time; it would be too distracting. Thus it is well that most of it remains unconscious, operating below the surface, until we choose to access it. Our conscious mind may dredge up a memory, or stir up a moment of purposeful self-reflection; but unless we have a good road-map to the territory they arose from, and solid bridges to that territory, those memories and reflections will just sink back into the subconscious, and the chance to make new connections and build new pathways will be lost. What drives an addict is often self-destructive, chaotic, reactive, juvenile and resentful. To preserve our recovery, our minds need to learn to be self-constructive, well-ordered, responsive, mature and forgiving. To develop these capabilities, we work Steps. The Steps help us to understand ourselves, reconcile ourselves with our past, overcome bad attitudes and helpless or arrogant postures, and make peace with ourselves, other people, and the Universe. That may sound like a lot! But it is doable, because fortunately, the Steps are in order for a reason, and we are counseled to work each one, (just for now,) as though the next one doesn’t exist. There’s no point in scaring ourselves by worrying about things to come that may seem insurmountable; we just take things one Step at a time, and one Step assignment at a time. By doing that, when we get to that next Step, or next assignment, we have already been well prepared, and the thing doesn’t seem so overwhelming at all. In the end, we may not even recognize ourselves for the fools we had been when we started. Recovering addicts with a program can become accomplished, honored and distinguished; pillars of their communities; the calm centers of their families; inspirations for many others, both inside and outside the Fellowship; and beings of light and grace, with dignity, love and great respect. Or, without a program, they can continue even in clean-time to be the lunatics, ne’er-do-wells and sleazeballs they had been while using! Recovery is not an accident; it is a decision, a choice. If we choose to become more conscious, and more responsible for our own lives, then we can change. If we will it and work for it, we can adjust our attitudes, our thinking, and our relationship with our memories and histories. Then, once we know ourselves and our psychologies better, we can begin the process of raising our consciousness to a higher level – so that we can dwell more on the sublime, and less on the ridiculous. Often in meetings, I’ve heard addicts confuse “conscience” with “conscious.” Conscience is the moral sense; that little voice that bothers you when you do something you know is wrong. Conscious means awake, aware, deliberate: making a conscious choice; and consciousness means the state of awakeness, or the level/degree of awareness. Many addicts prefer to knock their conscience unconscious, whether with drugs or some other addictive pastime or merely with denial, so they won’t have to feel guilty for being jerks. You may say: “Why is all that important to me now? I’m just struggling to stay clean, and to get myself out of the messes I created when I was using!” I’d reply that it’s about having better tools to deal with your problems. Einstein said, “We cannot solve our problems by using the same thinking with which we created them.” If we don’t rise above the addictive, defensive, panicky and resentful frame of mind where our baser impulses keep gaining the upper hand, then we will keep generating the same crises and miseries that we are trying to escape from. It will take a higher perspective, and more conscious tools, to overcome the “low mentality” that has kept sucking us down. And it will take more broad-minded, mature and generous mental habits to keep us from once again poisoning the relationships that we are trying to redeem from the messes we’ve made. 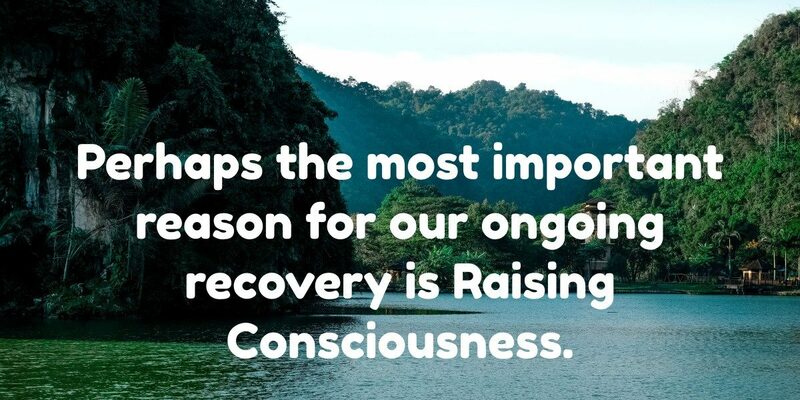 For that reason, raising consciousness is the absolute highest priority in developing and maintaining recovery – even though that is usually the last thing we would think of, from a newcomer’s perspective. This is the reason my first sponsor urged me to take the 11th Step out of order; he said I could start practicing prayer and meditation from the very start, and not wait till I had ten Steps under me first. It was important to develop God-reliance and peace of mind, because some of the things I’d have to look at and overcome would not be pretty or easy. If I wanted a good and happy life, and freedom from addiction and petty foolishness, I’d have to change the ways I thought, reacted, believed and behaved. Since I could not do that from the level of consciousness with which I started, I needed higher consciousness – preferably, Ultimate Consciousness – to sculpt a wiser, better life for myself. Sometimes, kids think their parents or teachers have “eyes in the back of their head.” Really, they just have experience with a kid’s mentality, having been there themselves, so they know how their kids will react. Similarly, sponsors understand what a newcomer is going through, because they went through it themselves. They know what it’s like to be a desperate, crazy addict; but they also know what it’s like to be a good example of recovery and sanity, so much so that other addicts would ask them to be their sponsor! Experience broadens perspective; which, if we’re paying attention, raises awareness. The predominant role of good sponsors is to serve as our “guides through the Steps.” They may also offer wise counsel regarding everyday problems, and usually are also willing to just be good listeners. But good sponsors do not try to be “all things to all people.” Sponsors might be psychologists, or doctors of medicine, or masters of meditation; but in most cases, they are not. Unless they’re control freaks, (wanting their sponsees to come to them for all their problems,) sponsors will freely admit when a certain problem or need is beyond the area of their expertise. Then they’ll suggest (as I touched on last time) that their sponsees find a good psychologist, doctor, or meditation teacher to help them further their healing process. They may even have a good idea on whom to consult; or they may have friends and contacts in recovery who have a better idea, and send their sponsees to the contact for suggestions. A good sign of wisdom, humility and sanity is the willingness to turn to others for help. Meditation, it turns out, is not some “airy-fairy” “magic spell”; rather, it is a simple mental technique to calm and quiet the constant, chattering, nagging mind; to combine deeper relaxation with heightened sensitivity; and to connect with the subconscious mind, and perhaps eventually with the “cosmic mind.” The purpose is to develop inner peace, self-understanding, and self-transcendence. All the great Spiritual Traditions have some kinds of “spiritual exercises,” which usually include some type of meditation – whether devotional or technical. Meditation seems to have a great deal in common with hypnosis: both create physical relaxation and heightened suggestibility, and open a “portal,” so to speak, to the subconscious mind. Bear in mind: just because something deals with suggestion or imagination, that does not mean that it is not real. When I was a teenager, I came across an old book my mother had on the topic of “self-hypnosis.” It turned out that my mother had used the relaxation techniques in it, when she was pregnant with me, and even when she was in labor! I learned from it how to successively relax and release the tension from each part of my body, using breathing and visualization. This helped me be at ease, and get to sleep more readily. Eventually, I found that I could release my bodily tension swiftly and entirely, and without having to go through an extensive rigmarole to get there. Practice makes perfect; and the same applies in meditation: reaching a calm and receptive state becomes more natural and speedy, the more well-practiced one becomes. Eventually, one can readily find an inner center of calm and peace anywhere – even in traffic, or a busy airport, or the middle of a crisis. When I was five years clean, I went to group hypnosis to stop smoking. I had smoked for 24 years; I was up to three packs a day; I was fed up with it, and willing – but uncertain. The hypnotist started the lecture section by explaining what hypnosis was, and what it was not. He said that he was notgoing to “put us into a trance!” The purpose of the “induction,” he explained, was to deepen relaxation and heighten suggestibility, so that we could then be receptive to suggestions. (Well, you can imagine that my recovering-addict ears perked up at that; in the rooms, we always talk about recovery in terms of following “suggestions!”) He told us, “Everyone practices self-hypnosis all the time! You give yourselves hypnotic suggestions every day! The problem is, you give yourselves the wrong ones: you tell yourselves negative messages, like, ‘Oh, stopping smoking is hard! Other people can stop, but it seems like I can’t! I don’t know if I can handle the discomfort!’ All those are untrue; they are invalid suggestions. But because you have repeated them to yourselves so often, you’ve come to believe them! However, I am an expert at this; and the advantage I have, is that I know the right suggestions.” So I listened, took the suggestions, and allowed it to happen. And it worked! I had one somewhat uncomfortable day, as my body detoxed; but since that day, I have never smoked a cigarette, or anything else, ever since; and that was in 1990. From this experience, I learned the importance of “self-talk”: giving the right suggestions (also known as “affirmations”) to oneself can be a major key to overcoming bad mental habits. (I also learned that the flexible, rational mind is willing to change its beliefs to conform to the facts; but the rigid, ideological mind stubbornly changes the facts to conform to its beliefs!) Similarly, meditation can be “guided” – that is, rather than just letting the mind drift in a free-form way, one can propose thoughts, ideas or tasks to the meditating mind; and it will work on them, in a gentle and relaxed way, to better understand and deal with them. 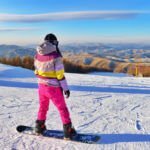 In a quite similar way, prayer is a process, or technique, for reasserting one’s connection to one’s Higher Power. Some may call this Power, “God”; some may call it the “Cosmic Mind.” Some may say that HP is nothing more than one’s own highest, deepest self; and some others may say that there is no contradiction between any of these Higher-Power concepts! But whatever we may call it, it is mainly important that we call on it. The more regularly we do so, the more natural and automatic the connection becomes. Praying sincerely and simply can be said to cleanse and clear the spiritual channels that connect us to Cosmic Love and Divine Will. God does not need to hear our prayers; God already knows the heart. Rather, we need to hear ourselvespray, in order to tune in and re-establish the connection. Eventually, we may find ourselves praying and meditating reflexively – in a continual, natural, informal, almost automatic manner, whenever needed, throughout the day. In this way, one’s consciousness is naturally raised – drawn higher, to meet one’s Higher Power in a more elevated state. And in the process, the very nature of our prayers changes. Rather than merely begging or cajoling a Deity for favors, one learns rather to ask for those properties and qualities that are life-affirming and spirit-enhancing: Serenity, courage and wisdom; honesty, open-mindedness and willingness; hope, strength and love; justice, mercy and humility; and others. We call these properties and qualities “Spiritual Principles,” and as recovery progresses, they become like old and dear friends, because they make our lives easy, natural, comfortable, and worth living. Since a God worth having would have always wanted us to have these spiritual gifts anyway, no begging is needed; we have but to ask – and in time, accessing them becomes as easy as falling off a log. To the using addict, Always Be Cool means: never let others see how helpless and desperate you really feel. To the newcomer in recovery, Always Be Clean means: Don’t pick up, no matter what – even if you feel cravings, hopelessness or overwhelming emotion, just remember that “this too shall pass,” and just pray, or call someone, or get to a meeting, and stay clean just for today. But for the member deeply immersed in recovery and Spiritual Principles, Always Be Conscious means: resist the temptation to go unconscious and become an automaton! Stay aware and awake in the present moment! Be alert to your feelings, your body, your fleeting thoughts, and the many ways your disease of addiction might try to trick, influence and discourage you. Rein in your impulses and unbridled desires, and weigh the balance between immediate gratifications and ultimate goals, and between risks and rewards. See yourself as you are and the world as it is; not as you fear or wish they were. Be ruthlessly realistic; but stay hopeful, thoughtful and wise. Think on your feet, be cheerful and harmless to yourself and others, and never lose sight of the fine being you aspire to become. For the newcomer, it may be challenging enough just dealing with “Don’t pick up, and get to meetings.” But knowing why we work Steps, and why we practice Spiritual Principles and prayer and meditation, can at least give the newcomer some clues of what they are working toward, and why long-time members remain so enthusiastic about their recovery. Getting clean makes possible this mental and spiritual revolution – which, in turn, safeguards our staying clean. The gifts of raising consciousness and of spiritual awakening can be profound, life-changing, and intensely gratifying. An addict who was once desperate and miserable, can learn to love life, shine, and be joyful. What it takes, more than anything else, is the willingness to follow suggestions. There was a guy who used to come to my home group about 25 years ago, who would always introduce himself as a “hard-headed addict.” We would all laugh when we heard this – because we knew that we were all hard-headed addicts! The same fellow quipped, “My disease was up a half hour before me, and had coffee made.” Unfortunately, the disease must have started getting up an hour ahead of him, because he disappeared. That doesn’t mean that he went back out; for all we knew, he may have moved somewhere else, or found recovery somewhere else. But relapse was, unfortunately, a safe bet – because experience has shown us that those who believe that they are exceptional, or that their disease is irresistible, have a lesser chance of recovery. Mind you, we’ve found that every addict is capable of recovery, as long as they do not pick up drugs, and try to practice the program conscientiously. If we stick around and keep at it, our reservations tend to evaporate, because the program starts to really work. Alas, before they’ve even given the program a fair try, a great many addicts look for loopholes and exceptions. Perhaps even most of us spend part of our time, in earliest recovery, looking for ways to disqualify ourselves: “You don’t understand – I’m a different kind of addict!” or “I might have made a mess of things, but I’m sure not as bad as those guys!” Hey – we all thought we were a special case; and we all minimized our own addiction – at first. It takes some kind of decision, event, crisis or scare to open addicts’ eyes, and convince them that they are not “terminally unique” – and that unless they take their recovery seriously and personally, they are at great risk of relapse. The so-called “pink cloud” of early recovery only lasts a little while. When it dissipates, addicts had better have a good grounding in the principles and practices of recovery, because things are gonna get real. As one addict put it, “I didn’t use drugs because I was ‘having a bad day.’ I used because I’m an addict.” The disease doesn’t need an excuse or a reason to use – but it’ll find a million of them. Most of us who used drugs chronically, were not merely palliating pain or depression, or trying to get high, or to just “use socially.” We were trying to escape from unhappiness, from the misery of everyday existence; to “chase that first high”; to avoid growing up; to deaden the terror of feeling alone in the universe. We didn’t understand that “there is no chemical solution to a spiritual problem.” And being addicts, we simply could not use successfully, because our brains were too susceptible to wretched excess – so we had no way to process intoxication without endangering our sanity, our freedom, and even our very lives. Getting clean stops the downward spiral into a slow death. But it’s not enough to just stop using. 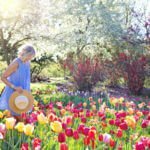 Unless we find a route to a happy life, with joy, gratification, meaning and purpose, then the very same conditions that brought us to our bottom, can easily lead us back to the peril of active addiction. Recovery does not merely “happen”; it is won. We have to practice fundamental principles of honesty, open-mindedness and willingness. We have to make a decision: to defeat the disease of addiction at all costs, and to stay clean no matter what. We then have to follow a way of life that has worked for other addicts who have stayed clean and continued to recover. If we do that assiduously and constantly, our victory over the disease is more than probable. 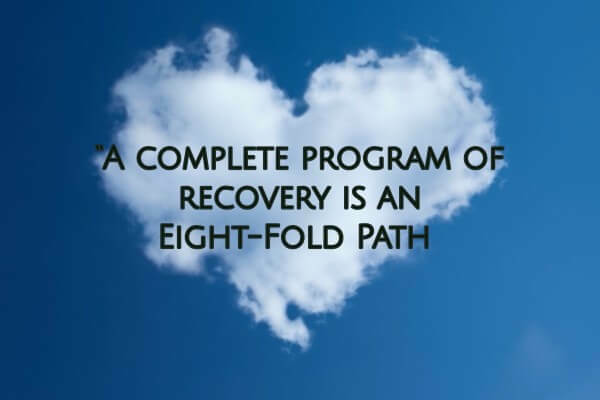 Even though nobody works a “perfect program,” and even when our commitment to recovery might wax and wane over time, as long as we practice those first principles and sustain those first decisions, the likelihood of relapse will steadily diminish. We learn from other members that there will inevitably be problems and setbacks in recovery; nothing in this world is perfect. But that’s no reason to give up. If we keep doing the right thing, we’ll keep seeing good results. Too often, newcomers have unrealistic expectations. “I’ve read the Steps; why aren’t I well yet?” “I’ve been clean for two months; why won’t my family start trusting me again?” “Other addicts in recovery have good jobs and successful relationships. Why am I still so lame?” “I keep having using dreams. Does that mean my recovery is doomed?” First, merely reading the Steps is not the same as working the Steps. Second, it took years to destroy others’ trust; we may have to show our loved ones, through the evidence of our actions, that we have become honest and trustworthy, and that does not happen overnight. Third, those successful addicts did whatever it took to rebuild a healthy, functional life. It didn’t happen by magic; it took work. Fourth, every addict I know in recovery has had using dreams. I’ve had them during every year of my recovery! It only means that the memory of using is very deep-set; it’s a subconscious echo or “ghost” of our using past. What changes is: when we wake up, we are relieved to know that we didn’t actually use, rather than disappointed!